Impromptu text after Aphex Twin and Florian Hecker’s performance at Warp 20, Cité de la musique, Paris. Aphex and Hecker: but what sort of ‘and’? The performances themselves are nothing other than the dramatization of this problem, which is codified in the enigmatic sigil § with which their conjugation is now denoted: Aphex § Hecker. What is certain is that it is not a case of complementarity or seamless integration. 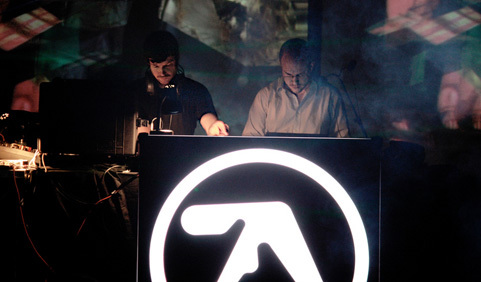 Because what is most remarkable about the coupling is both party’s indifference to integrating with the other: While Aphex spins a deftly selected set of acid and techno, Hecker appropriates elements of it and unleashes them in multidimensional sprays of sound which disseminate themselves through the performance space with absolute lack of politesse, with no regard to rhythmic or melodic congruence. Aphex fights back with more brutal beats. Hecker smothers them with a blanket of microsound. It’s more of a battle than a collaboration: a soundclash. No doubt for some (most?) members of the audience, unprepared for this sonic argument, the easiest option will be to reject one half of the equation. For Aphex fans starved of live performances no doubt the question becomes: What is Hecker doing here, ruining what could be a perfectly good DJ set? Although the same could be asked by devotees of contemporary electronic experimentation: What is Hecker doing courting vulgar rave populism… ? In either case, the only answer is: Interfering. Aphex § Hecker is the name of an interference pattern. Since the integration of ‘Aphex and Hecker’ cannot be completed at any rhythmic or harmonic level, the audience is forced to carry it out at a conceptual level; compelling them to consider what sound is, what it is that they are enjoying, what they are not, and what the difference is. Although sometimes Hecker’s contributions erupt abruptly, or arrive like a billowing sonic cloud embracing Aphex’s tunes without disrupting them, in the most interesting cases the phenomenon is akin to the situation where one is listening to music at home and an unexpected or unfamiliar sound interrupts: after the fifth or sixth repetition, one suddenly becomes retrospectively aware that the intrusive sounds are not part of the music. But what is it that precipitates this singular moment, when one sonic phenomenon is expelled from another recognized as an integrated group? Here we find a direct link to Hecker’s interest in Auditory Scene Analysis. Then at times Hecker gets the upper hand and drags us irresistibly into his world, while the prominent martial beats that had been the centre of attention wait shrinkingly in the wings. Any regularity on the immediately-perceptible level is defeated. But Hecker also mischievously détournes his own abrasive mathematical universe with tropes drawn from the art of rave and techno, winding the sounds up higher and higher until it the audience is trapped inside a giant cyclotron whose curve of intensity shows no sign of decelerating.